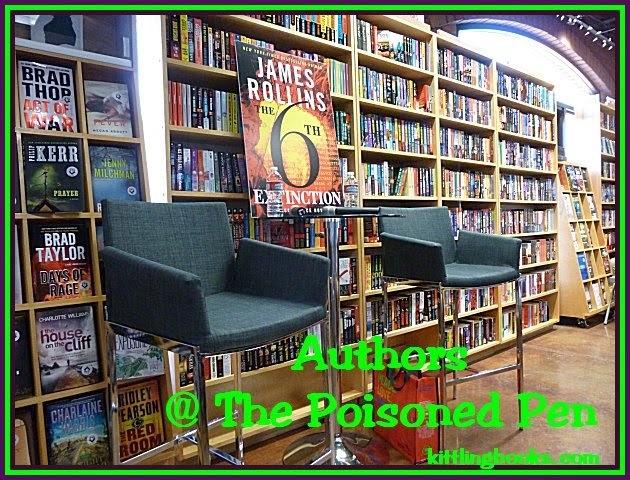 Jenn McKinlay and Beth Kendrick at The Poisoned Pen! Arriving at my destination was a bit interesting due to road closures for the Parada del Sol parade route, but I would not be denied. When I walked into the bookstore, it was humming with activity. Thousands of people come to the Valley of the Sun every year for baseball's spring training, and it seemed that many of them were in The Poisoned Pen looking for something to read. I quickly reserved my seat, reserved a copy of Andrea Chapin's The Tutor, and made my purchase. What I did next surprised The Poisoned Pen staff members: I asked them to sign the dedication page of Jenn's latest Hat Shop mystery, At the Drop of a Hat. Jenn has a wonderful dedication to Barbara Peters and the bookstore staff in this book, so my copy is filled with autographs! I then sat down in the back to read a few pages of my advance reading copy of Vasudev Murthy's Sherlock Holmes, The Missing Years: Japan, a book from Poisoned Pen Press that will be released next month. I didn't get all that much read though because I was having too much fun people watching. Customers were browsing the shelves and eyeing the little Valentines and Hershey's Kisses that were placed on each of the event chairs. I was really looking forward to this event because Beth Kendrick was appearing with Jenn McKinlay. I've met this author at CozyCon, and I know she's a lot of fun. The event began with Jenn reading her dedication to Barbara Peters and the staff of The Poisoned Pen. "Everyone needs a safe place. This is my safe place," Jenn told us, "and I'm not saying this because I'm sucking up!" Barbara then told us that she'd been trying to get Beth here for a long time, but one life event after another kept striking Beth, and she wasn't able to come. "This year is okay-- so far!" Beth laughed. I don't remember exactly how talk then moved to the world of public relations (hereafter referred to as PR), but it did. Beth knew someone who had been the PR for the K******ians and let us know that it was a nightmare job. "Which rock group was it that always wanted a big bowl of brown M&Ms in their room?" Jenn asked. Someone replied that it was Van Halen. "My husband is a musician; you'd think I'd know that already!" Jenn shrugged. "Anyway, someone told me that if Van Halen walked into their hotel room and saw that bowl of M&Ms, they could tell that the PR person knew how to follow instructions and that it should be a good show." "That makes sense," said Barbara. "Yes, it does," said Beth, "but that wasn't the case with the K******ians!" 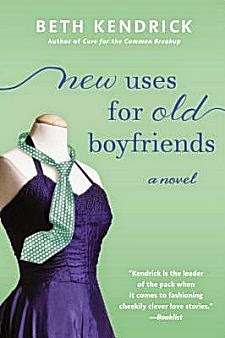 Beth then began to tell us a bit about her latest book, New Uses for Old Boyfriends, which isn't a series book even though it returns to Black Dog Bay, a setting that features in another of her novels. We all laughed at her insistence; however, in her defense, the setting may be the same, but the story concerns different characters. 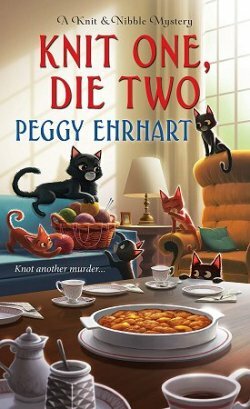 When complimented on the title, Beth thanked us and said that she has a good friend who is her "title genie." "There are no ugly, boring people in Black Dog Bay," Barbara observed. "There are. She just doesn't write about them," Jenn quipped. Beth turned to Jenn and asked, "Are you a plotter or a pantser?" Need a translation? Beth wanted to know if Jenn works with an outline-- or plot-- of her book as she writes, or if she writes by the seat of her pants-- no outline whatsoever. Jenn is a plotter, which she'd have to be with all the series she writes. "I tried plotting with one of my books," Beth said. 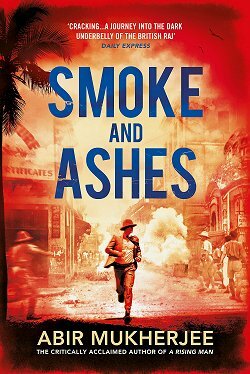 "Two-thirds of the way through writing the book I knew I'd chosen the wrong hero. I had to rewrite 400 pages!" Turning to Jenn, she asked, "This doesn't happen to you?" "No-- I'd kill myself!" Jenn exclaimed. "I need a map before I begin writing." 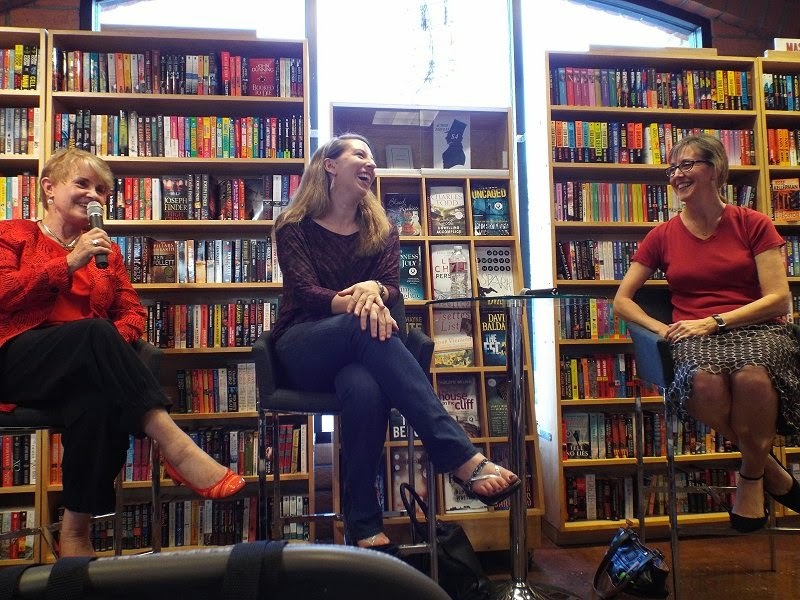 Both Jenn and Beth agreed that the middle part of the book was the most difficult to write, with Beth calling it "the doldrums." "Someone once said that way too many books have way too much middle and I agree," Barbara said. "I go through hundreds of books a month, and if they start bogging down in the middle, I start flipping pages. I just find it funny that the part you two struggle with is the part I skip!" Spoken like a true Editor-in-Chief! Jenn mentioned her contract, thinking that it said her books should each be 65,000 to 75,000 words. "I don't read that stuff. They're just guidelines anyway," she said with a smile. I sat there wondering how she knew I'd watched Pirates of the Caribbean that week and she'd immediately made me think of the pirate code of parley. "My contract says 80,000," Beth remarked. 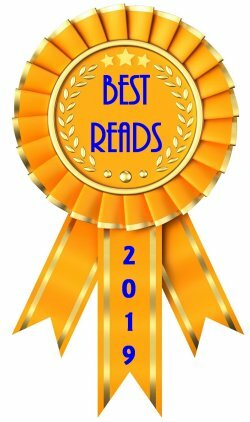 "Oh, you read yours!" Jenn said. "I have too many lawyers in my family," Beth replied. "Besides, I'm a Type A, I need a goal!" Jenn stared at Beth in disbelief. "But you're a pantser! This makes no sense!" This comedy duo had all of us in the palms of their hands, and they next led us into the world of the draft. Beth asked Jenn, "How many drafts do you write? I write three." Jenn looked at her and held up her pointer finger. "One. I write one." Beth stared at her in disbelief. "How many of you were here last week for Kristin Hannah?" Barbara Peters asked. 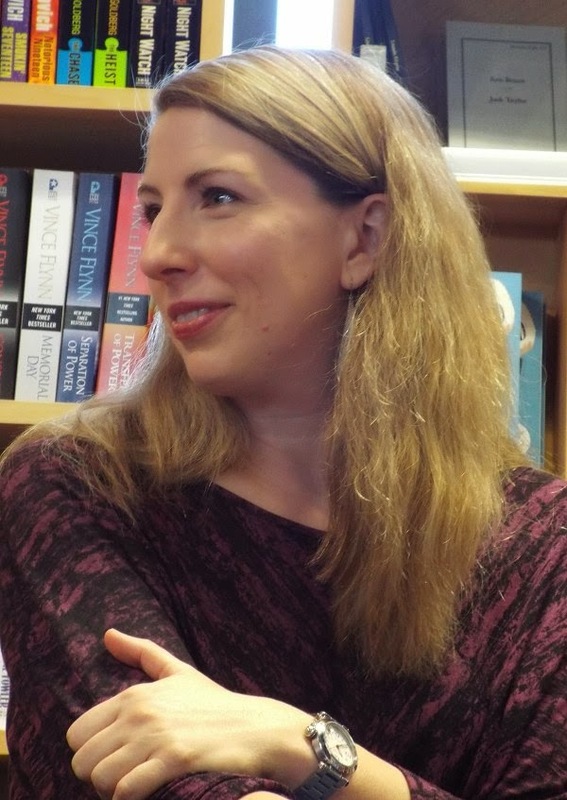 "This woman writes beautifully, and she's been doing it for over twenty-five years. When she is writing a book, she writes thirty drafts!" We all sat there in stunned silence. "The only reason I brought this up is to show you that a book is a living, changing entity. You only see the finished product. You have no idea how many lives a book touches on the way to its publication." 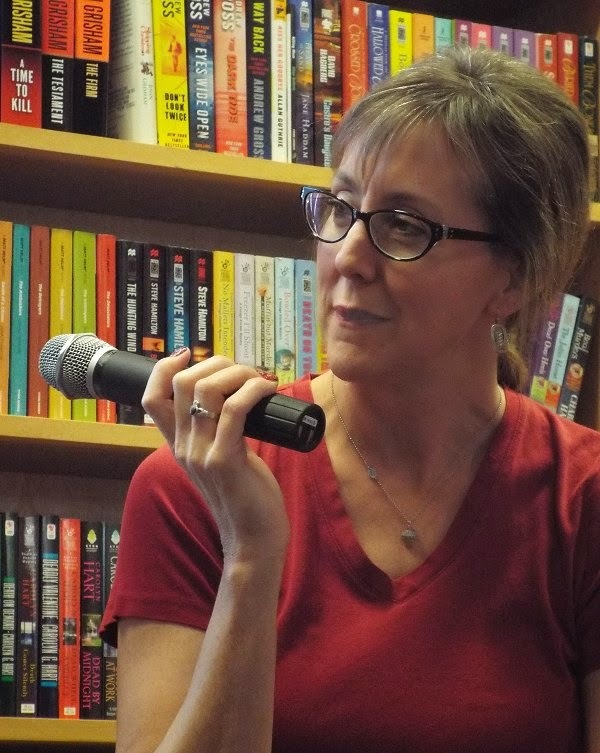 "I've written eight books in my Cupcake Bakery series now," Jenn said. "A lot of the backstory has already been done. I know these people. I know their mannerisms, their quirks. But when I wrote my first book, I think I went through five drafts." 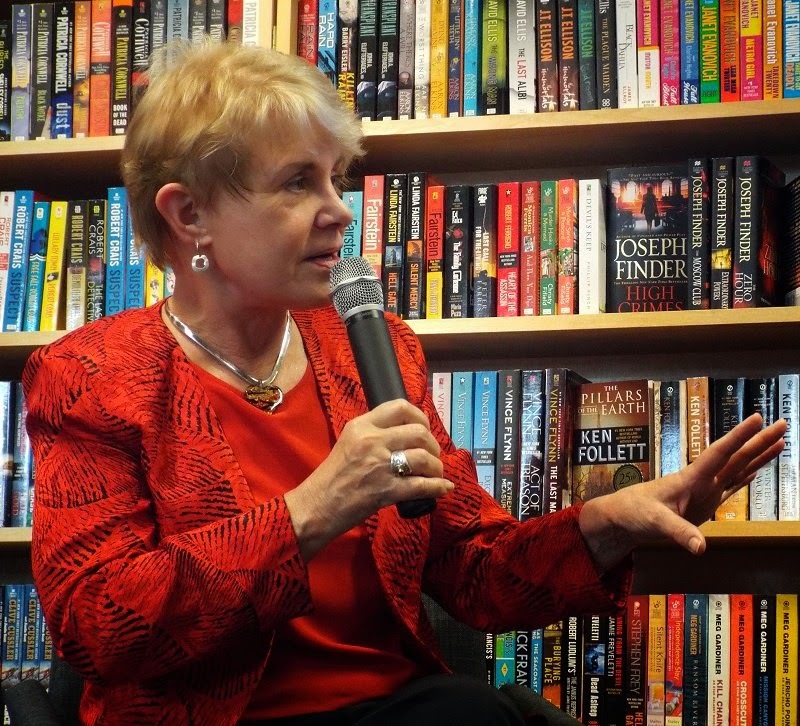 In referring to her latest book, Beth told us, "I had the idea of bringing this character-- a flight attendant who's used to traveling, to always being on the move-- to this small town, and she's stuck there." Jenn smiled. "Add a dead body, and you'd have a cozy!" which led her to talk a bit about her latest hat Shop mystery, At the Drop of a Hat (once we'd stopped laughing). 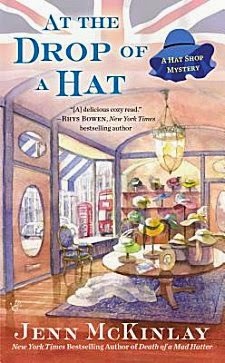 When At the Drop of a Hat debuted at #15 on the New York Times Bestseller List, her agent told her, "We might be going past six!" If you thought we let that news go past without clapping and cheering, you'd be sadly mistaken. Jenn avidly watched all the coverage of the royal wedding of William and Kate, and when she saw Princess Beatrice's hat, her first thought was, "I'd kill the guy who made that hat!" -- and a mystery series was born. Also author of the Cupcake Bakery cozy series, Jenn said, "Who knew cupcakes would still be going strong?" Barbara replied, "I think I know what the next big thing will be: making your own chocolate, which is evidently a very involved process. I watched Chef on Netflix about a chef who sets up a food truck. 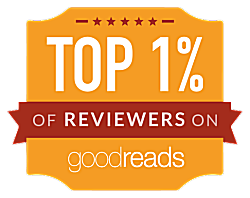 I really enjoyed it." Looking at Beth, she continued, "I can see it now. There's going to be a food truck roll into this little town of yours...."
"Black Dog Bay!" Beth exclaimed. "It's the best place in America to bounce back from a break-up. That's why there are all those hot guys in town!" And you thought you'd never learn why there were no ugly, boring people in Black Dog Bay. Just remember-- if you read Beth's next book and there's a food truck in Black Dog Bay, you heard it here first! 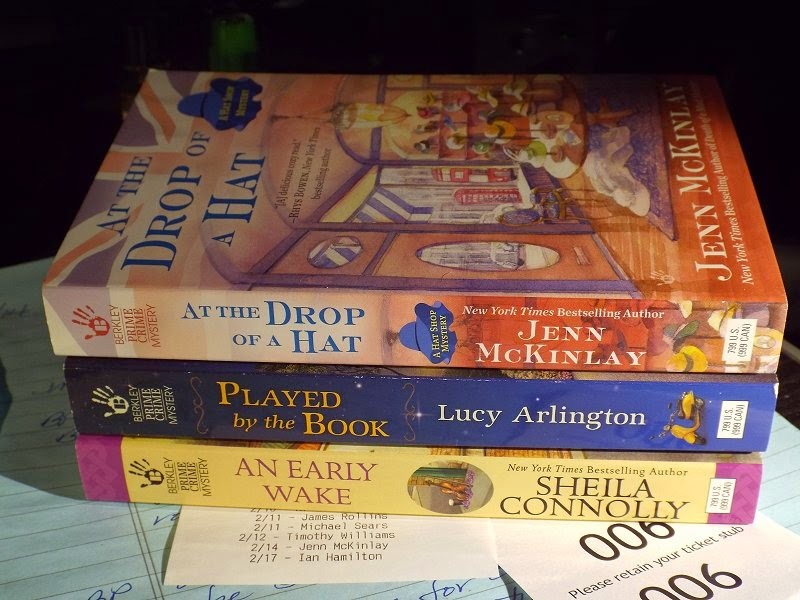 As always, Cathy, it's a delight to read about your PP adventures! It's kind of nice too when there are a couple of authors who can give different perspectives on the same ideas. Thanks as ever for sharing. Yes, having two or more authors with exactly the same perspectives on everything is rather... dull. Beth and Jenn are anything but dull. Ever! This was such a fun day, Cathy! Thanks for capturing it. Also, Beth and I have become plotting partners. We met over the weekend to help each other hash out our next books. Three and a half hours later, plots were born! Yes! This is the kind of news I LOVE to hear! glad it was so much fun as well as informative. There's just something about learning of the creative processes of others that fascinates me.